When I started tweeting in April 2009 I did so from my iPhone; I evaluated some Twitter Apps and if I recall well Twitterific was my first favourite. I didn't tweet so much and hardly ever on a PC/notebook, so the twitter.com website was -and still is- somewhat unknown to me. Until I discovered TweetDeck, a nice client for Windows and Mac with some interesting features and a nice look-and-feel (user interface I should say). 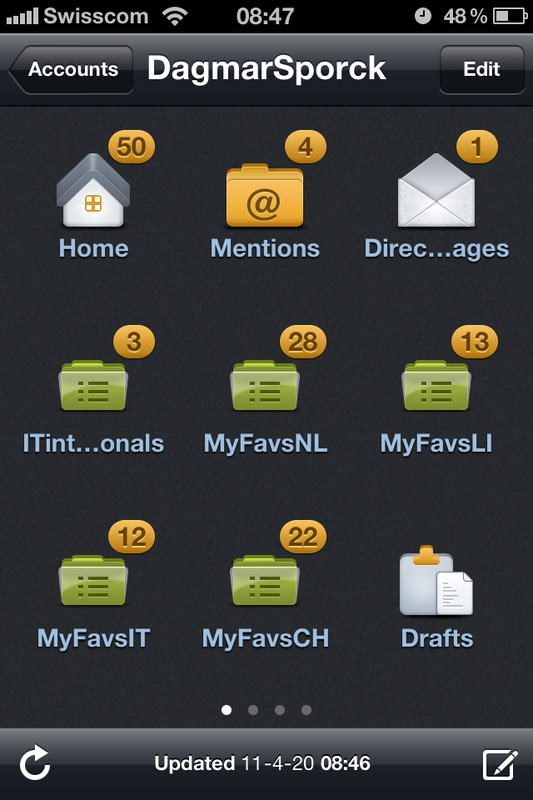 So from behind my desk my tweets started to become more frequent, I got more followers, causing more tweets, and so on. A year ago, beginning of 2010, my twitter frequency shot sky high when I started working in Switzerland, I was a lot away from home and discovered foursquare. The number of followers and tweeps grew and I needed to organise it a bit better. 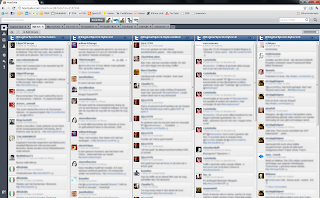 I starting using lists, first too many people in one list, then too many lists until I found the right equilibrium. I now have about 5 favourite lists with my favourite tweeps (although I sometimes forget to update them) and some lists with people I find interesting to follow but who need to be grouped together (in a list). Anyway, using lists I discovered the power of TwitBird (Pro), unfortunately (for some of you) only available on iPhone/iPad. Like most Apps it gives you access to your lists but the power of TwitBird is, is that you can filter already read tweets. So if I first scan my favourite lists, and then start reading my TL with all tweets I can filter the tweets I already read in the lists. 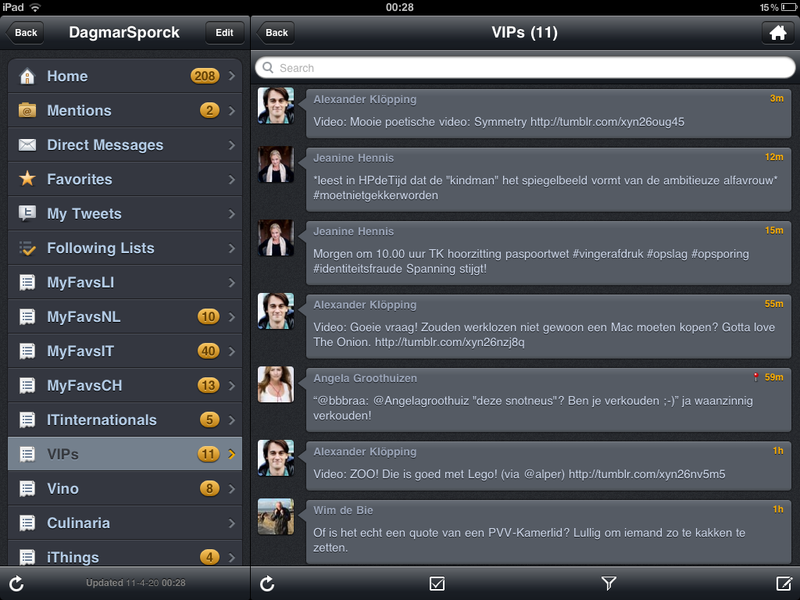 This enables me to scan quickly if there's something interesting going on in Limburg or in Switzerland or in any other region, subject that I've created a list or search for and also browse what else is going on in the TL without having to read the tweets I already read twice! *in the paid versions of HootSuite you can collaborate on twitter accounts with colleagues, it should be possible to appoint tweets to someone else so he/she can respond/take action. I never used this functionality so so I can't comment on it, but it sounds pretty useful for Social Media active companies. 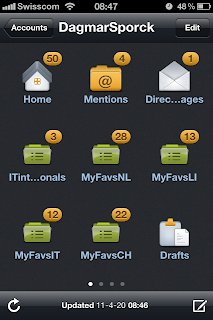 So what about TweetDeck? After the Xth crash of AdobeAir, missing mentions (some mentions that I saw in TwitBird in my iPhone just didn't display in TweetDeck), responding to the wrong tweet because the mouse pointer/cursor suddenly decided to select another tweet then the one I wanted to respond to I gave up, found HootSuite and that's where I am today. 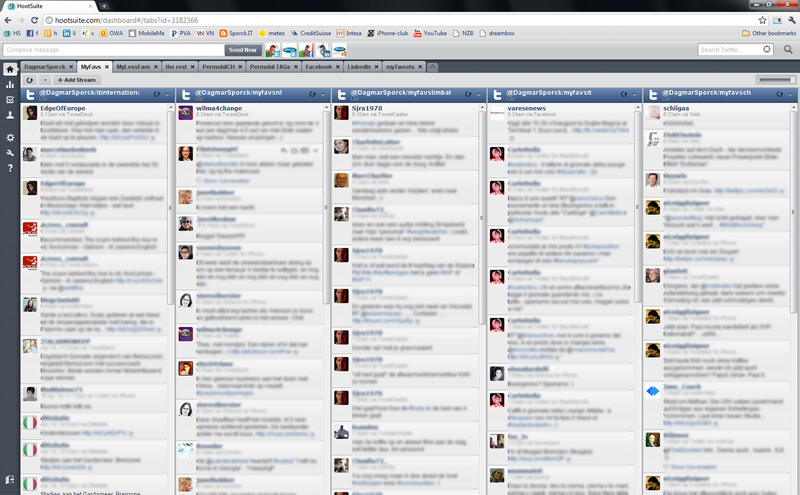 And HootSuite on my Windows/OSX PCs/notebooks! They should be targeted towards the people the business is catering. You simply cannot target everyone so do not commit that mistake https://twitter.com/darrenwinters01 follow this guy for the best reviews ! !